At last, a sunny day! To make the most of it we decided to use the car to visit as many locations as possible, rather than going for a walk. First of all, we revisited Countisbury Hill and took the sunny views along the Coast. Yesterday I didn’t even get my camera out of my rucsac. Today we walked out to the end of the headland, about 2.5 miles in total. Good views both east and west. 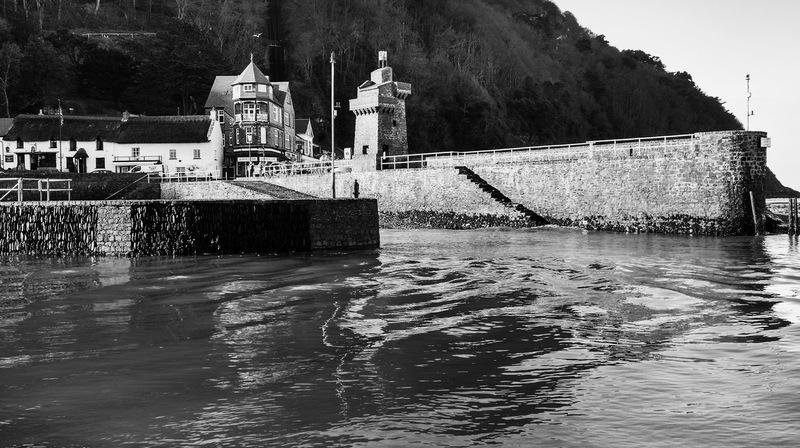 From the headland we could see Lynmouth beach and pier were sunlit. 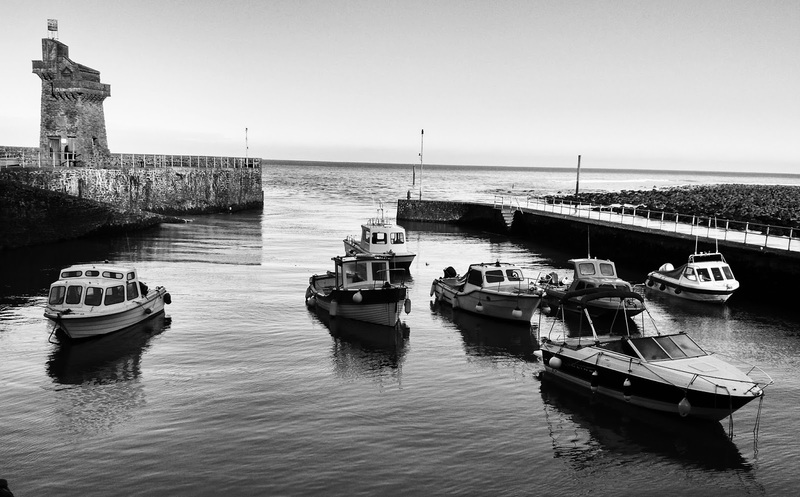 With the low sun at this time of year most of Lynmouth never catches the sun. We headed back for shots of the harbour, it was an hour or so from high tide. Nice light. I used both of my wide angle lenses to pick out different views and Ilford FP4. We were close to the hotel so we had a bit of a break before heading off to Lorna Doone country in early afternoon. The book Lorna Doone is set mostly in the East Lyn River valley so we only had a short drive (minutes) to get there. The low sun gave lots of interesting lighting and shadows. First stop was the Lorna Doone farm and old bridge. Really nice light illuminating the underside of the bridge arches. Had to wade into the river to get the angle I wanted on the shot. Then just a couple of miles to the 900 year old church in Oare. The best view was from the churchyard with the hills in the background. Last location on my list was Robber’s Bridge, a few minutes from Oare. This is a small bridge over a stream with overhanging trees and lots of bright green moss on the rocks. I meant to take a phone photo to illustrate this blog but forgot. Sorry. Next stop was a few miles away on Exmoor. Not planned but just had to stop and take a line of trees. The clouds behind them were fantastic too. I used my 43mm lens and an orange filter to start with then took a few with my red filter. Not sure which will be best. I didn’t want to darken the sky too much or the trees won’t stand out enough. I fear red may make the sky too dark. That was it. What a fantastic day! Can’t wait to see the negatives. Here are some phone photos to give you an idea of what I’ve taken.